nforo SMTP Integration | How to Integrate Pepipost With Xenforo? Xenforo and Pepipost Integration: Control more of your email! XenForo sends email on most servers using PHP’s default mailing settings. However, if you wish to control more aspects of the mail sent by XenForo, you can switch over to a third party SMTP service provider like Pepipost. 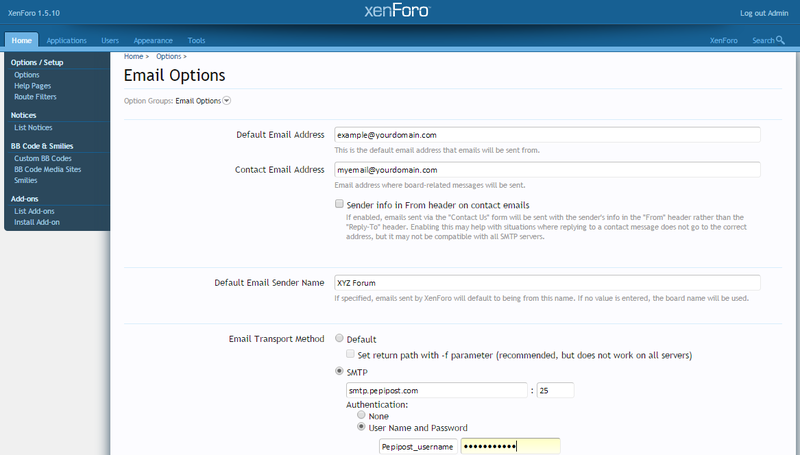 To configure SMTP on Xenforo, simply log into your admin control panel, go to Options and into the Email Options group. We have provided a step-by-step guide to configure Xenforo for Pepipost. Create an account on Pepipost. Go to “Domain Management” and “Add” your sender domain. This is the domain which system is going to use as sender while sending any type of email communication to your community members. The domain need to be verified, authenticated (using SPF) and approved before proceeding to further steps. Log into your Xenforo admin control panel, go to Options > Email Options group. Note: The sender domain should be configured and verified on Pepipost. You will be unable to send emails unless the sending domain is verified and approved on your Pepipost admin panel. Contact Email Address: Email address where board-related messages will be sent. Keep this unchecked as it is not supported by many SMTP providers. Default Email Sender Name: If specified, emails sent by XenForo will default to being from this name. If no value is entered, the board name will be used. Ideally it is a good practice to have board name in the default sender name. Port: Port can be 25, 587 or 2525. Most of the shared hosting providers block these ports to protect their network from spamming. If your emails are not getting delivered, then try contacting your hosting provider to unblock these ports for outgoing SMTP connection. Authentication: Select the radio button as “User Nameand Password” and enter your Pepipost’s username and password. Encryption: You can choose anything based on your requirement. But, to avoid any integration related challenges it is suggested to keep it None. Bounced Email Address: By default, bounces are been parsed and suppressed on Pepipost. In case you want to receive the bounces on another email address, then login to your Pepipost account and navigate through Settings > Customize > Bounce Notification. Add the email address where you would like Pepipost to forward the bounces. Once all the parameters are set, click on “Save Changes” and you are done. Now you can test whether emails are going out via Pepipost or not. Login to Pepipost > Live Feeds to view all the real-time logs of emails which are getting delivered via Pepipost SMTP.